Discover the key features and capabilities of the new Makito X4 Rugged Video Encoder direct from Haivision video experts. Learn more about the newly released Makito X4 Rugged from Haivision video experts. 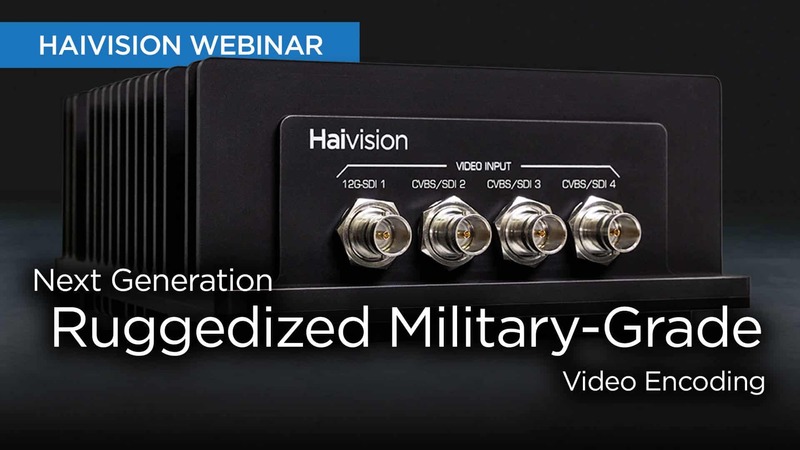 Watch this webinar to take a deep dive into the features which make this compact, 4-input ruggedized military-grade video encoder ideal for the most demanding environments and mission-critical ISR applications. Discover how the Makito X4 Rugged is built on the proven heritage of the Makito X series of encoders to deliver the best motion imagery quality and performance with extremely low end-to-end latency. Designed for deployment in the most demanding and harshest environments, discover more about the ruggedized compact form factor that makes the Makito X4 Rugged ideally suited for mission-critical ISR applications. Learn how the Makito X4 Rugged delivers exceptional quality, low latency AVC/H.264 and HEVC/H.265 video at very low bitrates for real-time situational awareness. With support for three analog composite inputs, four 3G-SDI inputs and one 12G-SDI 4K/UHD input, gain deeper insight into why the Makito X4 Rugged is both highly versatile and truly future proof.